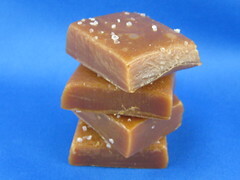 Mmmm, salted caramel!!!! What is the consistency of the finished product? Sticky? Soft & chewy? I might have to buy a candy thermometer & give these a try! I think I overcooked mine a little bit, but they’re still chewy. I think it all depends on how high of a temp you go. Either way, they’re YUM. I was planning to make David’s caramels too! Thank you for the step by step photos, now I have a better idea as to what colour to look for when cooking the caramel. Yours look delicious! These look great! One of my favorite treats 🙂 Haven’t made them in a while, so thanks for the recipe! Oh, I love those! So, so good. With butter, cream and fleur de sel, how could they not be? I’ve used cut up squares of waxed paper to wrap them and it worked well but Amazon has precut sheets of candy sized foil wrappers that are so pretty and work even better. I will ignore my thighs. I just need to buy salted butter (I’ve only bought unsalted butter for about 2 years now with all of the baking I do). Yum! I have the candy thermometer that looks kind of like a meat thermometer (no obvious bulb). Do you think the same tilting technique would apply? Also, while this should be obvious, do not use a plastic spoon. Ask me how I know! I was just at Marks and Spencer just now and was ALMOST grabbing the butterscotch caramels but didn’t. Now i totally wish I did. Yum recipe! Yesterday I went to Bill Granger’s famed restaurant Bill’s in Sydney – where I’m on holidays right now – and bought some salted peanut brittle to take home after brunch. that stuff is simply addictive! ill be blogging about it soon… of course salted caramel isnt exactly big news anymore but the flavours just compliment eachother so well they’re a classic by now! Hi – I made these and they taste great, but the consistency is off. They won’t hold thier form for anything. I let them cool, then tried to cut them and once I pull a piece out, the remaining caramel fills in the empty spot. Even after cooling overnight. I was finally able to cut them up and wrap them, but even a few days later, they just kind of ooze (I took a bite, left it on the counter on the wrapper and came back an hour later to a flat blob of caramel). Is there any thought on how to make them just a little less soft? I found this recipe the other day and wanted to try it so bad. So yesterday I did. I have cooked sugar many times in my life making divinity, pralines, fudge, and my lovely peanut brittle, but none of my recipes called for heating up to such a high temp so the 310 degrees had me a little scared. I made them, stirring occasionally so the mixture wouldn’t burn, and keeping a close eye on my thermometer, but apparently if burned after all because it was very evident in the final product. I know this isn’t the recipe’s fault and I really want to try again! I did make a caramel after that that was a simple dump everything in the pot and heat to 250 which turned out fine and I have another one I want to try as well. Maybe I will make this again later and have better results!